Inspired By True Events - Their stories seem to have a recurring theme. Their stories seem to have a recurring theme. 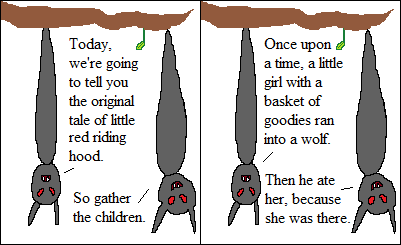 I’ve never liked the bad rap wolves get in fairy tales, but I do know that if something wants to eat you, it’s not gonna eat your nasty old grandma first. Plus, Red Riding Hood deserved it. She’s clearly too stupid to live if she doesn’t realize there’s a wolf in her grandmother’s bed. Click the tag to find the first of this now-recurring series.